It was a rainy Saturday, on the 16th of June but we were at Clubhaus der Freien Universität, preparing for the opening of Japanese sommer festival at 16hrs. There was a sake section, bonsai section, tea section, Japanese artist project section and more stalls upstairs. 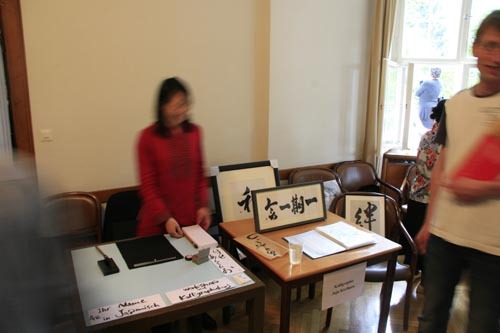 I had my table, actually two tables, one for mini-exhibition and other for work. 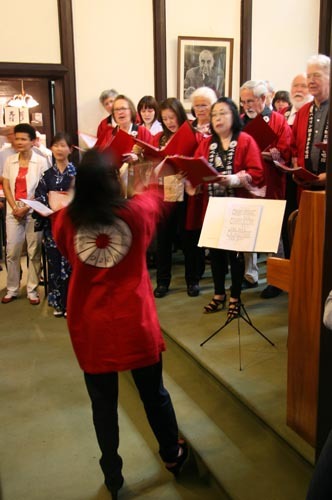 The Sommerfest began with the Ambassador´s greetings and a sing of a Germany-Japan mixed choir group. They sang some Doyo (children´s songs) that I´d heard when I was small. This is my work station. 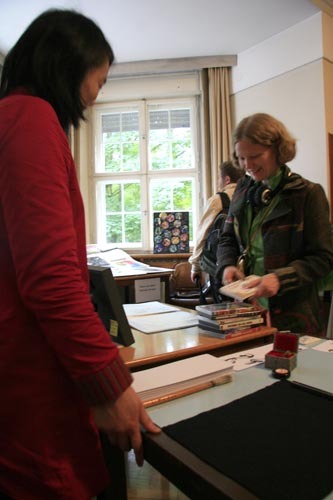 "your name in Japanese", it´s typical demonstration for these type of event but the visitors were very patient with my terrible German and I could work without stressing myself. This is a paper bug with "ありがとう (arigatou/thank you)" written. Thank you for coming and thank you for buying my works. Some people I´ve met in this short period of time in Berlin came too, which was nice. 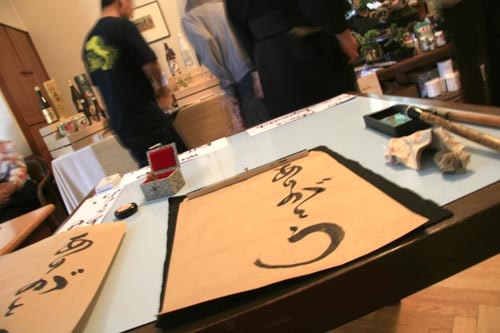 And I´ve met new people there, some I may see them at my workshop and some I may see them at the calligraphy class soon. A lady bought a work "絆 (kizuna/bonding)". She was very happy to take it with her and kept telling me thank you. But I think it was me who wanted to thank her. Experimental Calligraphy performed for the one year after the quake memorial event in Madrid on the 11th of March 2012.